1. Know the fundamental rights and freedoms outlined in the charter. 2. Be able to review individual cases and highlight how the charter protects individuals. In 1982, the Pierre Trudeau’s Liberal government included The Charter of Rights and Freedoms in Canada’s constitution. 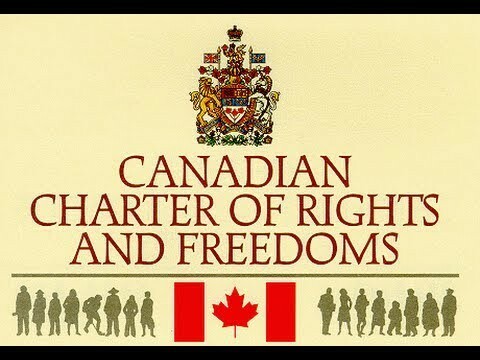 The Charter is founded on the rule of law and entrenches in the Canadian Constitution the fundamental rights and freedoms necessary to live in a free and democratic society (Government of Canada). It provides fundamental freedoms (freedom of expression & association), democratic rights, legal rights (right to life, liberty and security), equality and language rights. Groups of 4, review The Canadian Charter of Rights & Freedoms provided by the teacher (one copy per group). Complete the case studies in the right hand column as a group. Your group will be assigned a specific case to present to the class. Human rights are not absolute, they are subject to reasonable restrictions. This does not mean that rights can be arbitrarily disregarded. Rights are subject to limitations, so as to not interfere with others' rights. #1 Freedom of expression in the press may not be appropriate in cases of national security or criminal case that is going to trail. #2 Mobility rights may be suspended after a natural disaster to allow for emergency vehicles to help victims. #3 Freedom of association may interfere with others' rights if traffic is prevented from moving. Both parliament and provincial legislatures have a limited power under section 33 to pass laws that are exempt from certain Charter provisions - those concerning fundamental freedoms and legal and equality rights. In order to rely on this section, parliament or a legislature must state specifically that a particular law is exempt from the Charter. It must also state which sections of the Charter do not apply. An exemption from the Charter lasts a maximum of five years.